You hope to explore every inch of Alaska, but some of your friends or family want to spend every waking moment fishing. Luckily, Anchorage is the perfect spot to keep everyone happy. See the sights, let the anglers spend plenty of time on the water, and still share special moments together. Get the anglers geared up. Anchorage is the best spot for shopping, regardless of whether you are looking for new lures or casting around for another kind of find. Get set up at an outdoor store. Even grocery and gas stations sell 3-day licenses. Point your anglers to Ship Creek for king or silver salmon. Rental gear is available on-site from The Bait Shack. While they cast, everyone else can enjoy the nearby pavilion at Kings Landing, stop in at the Ulu Factory, or stretch your legs on the nearby Ship Creek Trail. Check out the Anchorage Market & Festival every weekend or browse local boutiques and gift shops. Fishing is best on the incoming tide, leaving you plenty of time for an activity together once the tide goes out. Find a salmon quesadilla or some rockfish tacos for lunch and then get familiar with Anchorage. Many day tours depart from downtown Anchorage and include transportation. Consider scheduling one before or after the best fishing of the day, that way everyone can go. Find a bar or pub for a cozy meal tonight. If your anglers really can’t get enough fish, have them try beer-battered halibut. Wash it down with smoked salmon vodka…No? Take flight! Bush planes depart Anchorage for remote lakes and lodges, and the trip itself is the tour of a lifetime. You’ll soar over pristine waterways, vast untouched forests, and see some of the tallest mountains on earth. Then land in a spot where few venture; it’s your own private retreat for the day. Spend a day off the road system. 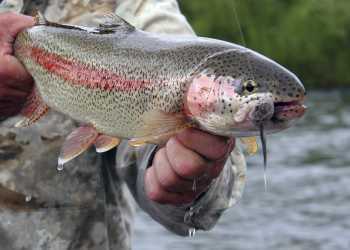 They’ll get their fill casting for trout, grayling, silver and red salmon. You won’t be left skipping rocks on the beach if you decide not to fish. Many lodges offer other activities, from guided hiking or paddling to cooking courses or even spa treatments. Find out what Alaskans do with all that fresh fish. After your flight back to Anchorage, check out one of the city’s best seafood restaurants. Spend the first part of the day together aboard the Alaska Railroad. The Glacier Discovery train departs Anchorage for Whittier. Grab breakfast in the train’s dining car. And enjoy a narrated trip south along the edge of the Chugach Mountains. Huge halibut lurk in the depths of Prince William Sound. Hook up with a charter in Whittier and send them out for a day of deep sea fishing. From here, you have many options. Follow the fishermen out on the water aboard a day cruise or with a kayak. You’ll see some behemoths as well, but yours will be fin whales and massive tidewater glaciers. Blackstone Bay, Harriman Fjord and Esther Passage are all popular stops in the sound. Alternatively, you can stay aboard the train and venture out to Grandview. Widely considered the most scenic stretch of the Alaska Railroad, Bartlett Glacier and Trail Glacier punctuate valley vistas in Grandview. No matter what you choose, you’ll be back in Whittier in time to greet the return of your adept anglers. Make arrangements with the charter to have fish cleaned, packed and shipped home. Several businesses at the Anchorage airport can also help ship boxed fish home without any hassle. Board the train for the ride back to Anchorage. Humans aren’t the only ones who pursue fish; beluga whales feed on fish runs in Turnagain Arm. Keep your eyes on the water as the train rolls along the coastline, the whales are often more active in the evening hours. The low summer sun is also perfect lighting for landscape photos from the train.